Draft: 2007, Los Angeles Angels, 50th rd. A non-roster invitee to Spring Training, Efren has appeared in 153 major league games in five seasons with the Angels (2011, 2013-15) and Tigers (2017) ... signed a minor league contract with the Cubs in January... Has batted .243 (77-for-317) with 16 doubles, two triples, three homers and 22 RBI in 153-major league games ... appeared in a career-high 64 games in 2014 with the Angels... Is in his 12th professional season ... has batted .295 (1,343-for-4,557) with 282 doubles, 65 homers and 604 RBI in 1,241-career minor league games... Played three games with Team Mexico in the 2017 World Baseball Classic, going 4-for-9 (.444) with three runs scored, one double and one RBI... Appeared in the 2014 ALDS with the Angels, going 0-for-1... Named a mid-season All-Star in 2008 (Cedar Rapids/Midwest League) and 2013 (Salt Lake/PCL) ... also named a post-season All-Star in 2013 ... earned a MILB Gold Glove in 2011 with Salt Lake... Selected by the Angels in the 50th round of the 2007 draft out of the University of Nevada - Las Vegas (UNLV). Spent the majority of the season with Triple-A Toledo, appearing in 131 games ... was a September call-up to the Tigers and batted .230 (14-for-61) with two homers in 23 games... Recorded his first-career multi-homer game, September 23 vs. Minnesota, going 2-for-3 with two solo homers... Went 2-for-22 (.091) in his first nine games with the Tigers ... in his final 14 games, he batted .308 (12-for-39) with a double, triple, two homers and seven walks (.413 OBP)... Batted .276 (132-for-479) with 23 doubles, 10 homers and 61 RBI in 131 games with Toledo. Split time between the Seattle and St. Louis organizations, batting a combined .275 (128-for-465) with seven homers in 126 games with Triple-A Tacoma and Triple-A Memphis... Began the season with Triple-A Tacoma and hit .243 (65-for-268) with 40 runs scored, 11 doubles, three triples, five home runs and 31 RBI in 72 games ... was released by Seattle, June 29, and appeared in one game with Toros de Tijuana of the Mexican League... Signed a minor league contract with St. Louis, July 8 ... hit .320 (63-for-197) with 28 runs scored, five doubles, two home runs and 17 RBI in 54 games with Memphis ... played in 34 games in August/September and hit .307 (39-for-127) with 15 runs scored, three doubles and 13 RBI... Appeared in 58 games with Naranjeros de Hermosillo in the Mexican Winter League and hit .271 (62-for-229) with 24 runs scored, 11 doubles, one triple, four home runs and 33 RBI. Split the season between Triple-A Salt Lake and Los Angeles (A.L. ), combining to play in 126 games ... made his first-career Opening Day major league roster ... batted a career-high .253 (21-for-83) with four doubles and five RBI in 54 major league contests... Notched two three-hit games with the Angels, June 11 at Tampa Bay and June 23 vs. Houston... With Salt Lake, he batted .329 (93-for-283) with 24 doubles, two homers and 29 RBI in 72 games... Recorded a 10-game hitting streak with Salt Lake from April 24-May 12 -- batted .500 (20-for-40) with 11 runs scored, five doubles, one home run and four RBI during the 10-game stretch. Made four different stints with the Angels, batting .245 (39/159) with 10 doubles, one triple, one home run and 14 RBI in 64 games...Connected for first career home run July 26 vs. Detroit...Made 28 appearances at first base, 23 in left field, six in right field and four at DH...Posted a .989 fielding percentage in 55 games in the field...Went 2-for-6 with a double, triple and three RBI as a pinch hitter...Tallied a pinch-hit, walk-off double in the 16th inning July 18...Marked first career walk-off hit and the first pinch-hit walk-off by an Angel since Alberto Callaspo Sept. 7, 2012 vs. Detroit...Initially recalled from Triple-A Salt Lake May 9...Optioned back to Triple-A May 22...Recalled for the second time June 21 before being optioned back June 27...Recalled July 12 and optioned back to Triple-A for the final time Aug. 30...Last recall came Sept. 2...Played in 72 games with the Bees, batting .326 (89/273) with 19 doubles, three triples, four home runs and 50 RBI. Appeared in four games for the Angels, going 1-for-4 with an RBI and a SB…Recalled from Triple-A Salt Lake Sept. 16 and made first big league appearance since 2011 that night...On Sept. 22, made first start and collected first big league hit since September 28, 2011…Also logged first career big league RBI on Sept. 22... Spent a majority of the season with Salt Lake...In 134 games for the Bees, hit .326 and led the PCL with 39 doubles…His 167 hits ranked second in the league while his 81 RBI were tied for eighth... Named a PCL All-Star and was the lone representative for the Bees...Tabbed as the starting first baseman for the All-PCL team...Voted the best defensive first baseman in the PCL by PCL managers. Established a Triple-A Salt Lake record and led all minor league players with 141 games played in 2012, breaking the previous record of 139 games held by Mark Trumbo... Named the Angels Minor League Defensive Player of the Year and rated as the best defensive first baseman in the PCL by Baseball America... Batted .294 (155-for-528) with 35 doubles, one triple, seven homers and 74 RBI. Began 2011 at Triple-A Salt Lake...Was second on the Bees batting .317 with a career-high 12 home runs...Led all qualifying first basemen with a .998fielding percentage...Awarded a 2011 Minor League Rawlings Gold Glove and was recipient of Angels Organizational Gold Glove...Contract selected by Angels, Sept. 1...Pinch-hit appearance, Sept. 2 marked Major League debut...On Sept. 28, notched his first two Major League hits in the final game of the season vs. Texas. He played in 128 games with Double-A Arkansas ... rated as the best defensive first baseman in the Texas League by Baseball America ... batted .267 with six homers and 50 RBI. He appeared in 130 games with Single-A Rancho Cucamonga ... named best defensive first baseman in the California League ... batted .287 with five homers. Named to the 2008 Midwest League Mid-Season All-Star team...Ended the 2008 season hitting .349 over 35games with Ranch Cucamonga Quakes. He played in 45 games between the AZL Angels and Orem in his debut season ... batted .353 in five games in the Arizona League and .212 in 40 games with Orem. June 14, 2018 Iowa Cubs released 1B Efren Navarro. June 8, 2018 Iowa Cubs placed 1B Efren Navarro on the temporarily inactive list. May 29, 2018 Chicago Cubs sent 1B Efren Navarro outright to Iowa Cubs. May 26, 2018 Chicago Cubs designated 1B Efren Navarro for assignment. April 17, 2018 Chicago Cubs optioned 1B Efren Navarro to Iowa Cubs. April 15, 2018 Chicago Cubs optioned 1B Efren Navarro to Iowa Cubs. April 10, 2018 Chicago Cubs selected the contract of Efren Navarro from Iowa Cubs. February 21, 2018 1B Efren Navarro assigned to Iowa Cubs. 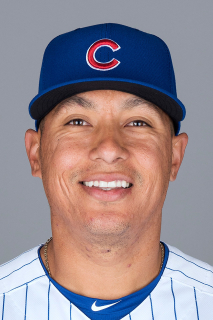 January 31, 2018 Chicago Cubs signed free agent OF Efren Navarro to a minor league contract and invited him to spring training. November 6, 2017 1B Efren Navarro elected free agency. November 3, 2017 Detroit Tigers sent 1B Efren Navarro outright to Toledo Mud Hens. September 1, 2017 Detroit Tigers selected the contract of 1B Efren Navarro. January 10, 2017 Detroit Tigers signed free agent 1B Efren Navarro to a minor league contract and invited him to spring training. January 10, 2017 1B Efren Navarro assigned to Toledo Mud Hens. November 7, 2016 1B Efren Navarro elected free agency. October 11, 2016 OF Efren Navarro assigned to Naranjeros de Hermosillo. July 8, 2016 1B Efren Navarro assigned to Memphis Redbirds. July 7, 2016 St. Louis Cardinals signed free agent 1B Efren Navarro to a minor league contract. July 7, 2016 Toros de Tijuana released 1B Efren Navarro. July 5, 2016 1B Efren Navarro assigned to Toros de Tijuana. June 29, 2016 Tacoma Rainiers released 1B Efren Navarro. March 2, 2016 Seattle Mariners signed free agent LF Efren Navarro to a minor league contract and invited him to spring training. March 2, 2016 1B Efren Navarro assigned to Tacoma Rainiers. February 28, 2016 LF Efren Navarro elected free agency. February 28, 2016 Baltimore Orioles sent LF Efren Navarro outright to Norfolk Tides. February 25, 2016 Baltimore Orioles designated LF Efren Navarro for assignment. January 26, 2016 Los Angeles Angels traded LF Efren Navarro to Baltimore Orioles for cash. January 19, 2016 Los Angeles Angels designated LF Efren Navarro for assignment. September 2, 2015 Los Angeles Angels recalled LF Efren Navarro from Salt Lake Bees. July 31, 2015 Los Angeles Angels optioned LF Efren Navarro to Salt Lake Bees. July 29, 2015 Los Angeles Angels designated Efren Navarro for assignment. July 28, 2015 Los Angeles Angels recalled LF Efren Navarro from Salt Lake Bees. July 10, 2015 Los Angeles Angels optioned LF Efren Navarro to Salt Lake Bees. May 30, 2015 Los Angeles Angels recalled Efren Navarro from Salt Lake Bees. May 8, 2015 Los Angeles Angels optioned LF Efren Navarro to Salt Lake Bees. May 1, 2015 Los Angeles Angels recalled Efren Navarro from Salt Lake Bees. April 21, 2015 Los Angeles Angels optioned LF Efren Navarro to Salt Lake Bees. September 2, 2014 Los Angeles Angels recalled Efren Navarro from Salt Lake Bees. August 30, 2014 Los Angeles Angels optioned LF Efren Navarro to Salt Lake Bees. July 12, 2014 Los Angeles Angels recalled Efren Navarro from Salt Lake Bees. June 28, 2014 Los Angeles Angels optioned 1B Efren Navarro to Salt Lake Bees. June 21, 2014 Los Angeles Angels recalled Efren Navarro from Salt Lake Bees. May 23, 2014 Los Angeles Angels optioned Efren Navarro to Salt Lake Bees. May 9, 2014 Los Angeles Angels recalled Efren Navarro from Salt Lake Bees. March 17, 2014 Los Angeles Angels optioned 1B Efren Navarro to Salt Lake Bees. October 7, 2013 LF Efren Navarro assigned to Naranjeros de Hermosillo. September 16, 2013 Los Angeles Angels selected the contract of 1B Efren Navarro from Salt Lake Bees. January 14, 2013 Los Angeles Angels invited non-roster 1B Efren Navarro to spring training. October 14, 2012 1B Efren Navarro assigned to Aguilas Cibaenas. February 12, 2012 Los Angeles Angels invited non-roster 1B Efren Navarro to spring training. October 28, 2011 Los Angeles Angels sent Efren Navarro outright to Salt Lake Bees. October 14, 2011 1B Efren Navarro assigned to Aguilas Cibaenas. September 1, 2011 Los Angeles Angels selected the contract of Efren Navarro from Salt Lake Bees. April 6, 2011 Efren Navarro assigned to Salt Lake Bees from Arkansas Travelers. January 28, 2011 Los Angeles Angels invited non-roster 1B Efren Navarro to spring training. April 6, 2010 Efren Navarro assigned to Arkansas Travelers from Rancho Cucamonga Quakes. February 3, 2010 Los Angeles Angels invited non-roster 1B Efren Navarro to spring training.